Hearts were in decent form by the time St Mirren came to Tynecastle on January 14th, 2012. Paulo Sergio’s side were unbeaten in their last five matches, including a 3-1 derby victory at Easter Road and a Scottish Cup win against non-league Auchinleck Talbot. Sitting fourth in the league table, the Jambos were firmly in the hunt for Europe. Motherwell occupied third – two points ahead of Hearts but with two games in hand – while hot on their heels were St Johnstone in fifth place, only on goal difference. Opponents St Mirren were pushing for a top six place. 8th in table, goal difference separated them, Dundee United and Kilmarnock, with the latter two sides in sixth and seventh respectively. Hearts and St Mirren had met twice already prior to this game, with a Jamie Hamill goal and Lee Mair’s own goal giving the Jambos a 2-0 win at Tynecastle while the St Mirren Park fixture ended in a stalemate. Hearts: Kello, Hamill, Barr, Webster, Mrowiec, Zaliukas, Black, Robinson, Sutton, Elliott, Skacel. Subs: MacDonald, Novikovas, Obua, Suso, C. Hamilton, Holt, Glen. St Mirren: Samson, van Zanten, Tesselaar, McAusland, Barron, Mair, Teale, McGowan, Thompson, McLean, Carey. Subs: Smith, Thomson, Hasselbaink, Reilly, Naismith, Murray, Mooy. To say this game was action-packed would be an understatement. It took only one minute for the deadlock to be broken, and it was in Hearts’ favour. Scott Robinson forced a corner straight from kick-off, which Ian Black floated in for Marius Zaliukas to power home a header beyond Craig Samson from inside the six-yard box. Ten minutes later the visitors were back on level terms and the men in maroon were down to ten men. Kenny McLean’s long ball over the top found the run of Paul McGowan and as he went one-on-one with Jamie MacDonald, Zaliukas bundled him over from behind. Referee Steven McLean pointed to the spot and issued the skipper his marching orders. McGowan dusted himself down and lifted his penalty high into Marian Kello’s top left corner. It was 2-1 before the 20-minute mark. Marc McAusland intercepted Stephen Elliott’s wayward pass and drove forward before swinging a ball to the edge of the box for Steven Thompson to loop a header over Kello and into the back of the net. The frantic pace continued, with Hearts drawing level on 23 minutes. Black’s corner was cleared but Rudi Skacel robbed Graham Carey of possession 20-yards out before thundering an unstoppable effort past Samson, high into the roof of the net. The fans were afforded some breathing space before both sides went at it again in the second half. Carey advanced to the edge of the Hearts box before unleashing a left-foot piledriver that Kello did well to beat away. A five-minute brace of goals saw Hearts take and then extend the lead. Jamie Hamill’s throw into the St Mirren box was nodded down by John Sutton for Skacel to move the ball from his right to left foot before tucking the ball into Samson’s bottom right corner. The Czech’s hat-trick was complete on 68 minutes. Black showed great tenacity to win the ball from David Barron around 30-yards out before Skacel took control, weaving his way to the St Mirren box before swinging an effort back across the face of goal and into the bottom corner, past the despairing Samson. 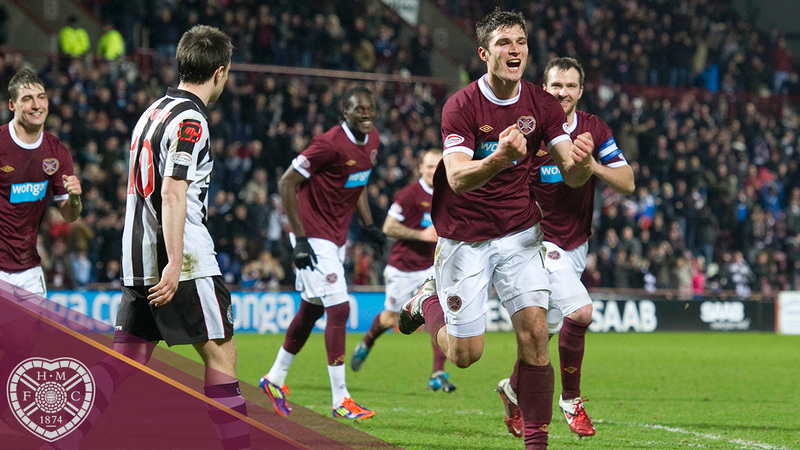 The trio of goals was Skacel’s second hat-trick against the Buddies. There was still time for a fifth and it came in the 90th minute. After Thompson had headed over from Gary Teale’s cross, Hearts were awarded an indirect free-kick inside the St Mirren box when Jeroen Tesselaar’s passback was gathered by Samson. From seven-yards, Black touched the ball to Suttion, who slammed past no less than eight St Mirren players on the line. The win saw Hearts leapfrog Motherwell into third place, though the Steelmen had two games in hand, which would prove to be crucial to securing European football. Hearts’ six-game unbeaten run would come to an end the week after with a 1-0 loss away to Inverness Caledonian Thistle as league form began to take a dip; Sergio’s side failed to win any of their next five Premier League games, though they did make progress through to the latter stages of the Scottish Cup. The Jambos would finish the campaign in fifth, seven points of fourth-placed Dundee United and two points ahead of St Johnstone. A Europa League Play-Off spot was secured though, thanks to a resounding 5-1 Scottish Cup Final triumph over city rivals Hibs. Richard Bath (The Scotsman): From the moment that Marius Zaliukas rose unchallenged at the near post to head Hearts ahead in the first minute to the moment when John Sutton’s sledgehammer drive ballooned the back of the St Mirren net a minute before full-time, this hugely entertaining game crackled with intensity, quality and an almost palpable desperation to win from both sides, all played out against the deafening backdrop of a broiling Tynecastle. With the Hearts skipper sent off in questionable circumstances just 12 minutes into the game and St Mirren fiercely contesting Hearts’ second goal, this come-from-behind win by ten-man Hearts had drama and controversy by the barrowload. But mostly it had goals, seven of them in all, with a Rudi Skacel hat-trick of rare quality one of the undoubted highlights of the season so far. Alan Pattullo (The Scotsman): If it is to prove his last Tynecastle appearance – and he expressed the hope that it wouldn’t be – then this was a delirious way for Rudi Skacel to sign off. The midfielder reprised last season’s hat-trick performance against St Mirren to again dismay the visitors, who found the ten men of Hearts too industrious to cope with. Colin Duncan (Daily Record): It was a hat-trick from another planet and Rudi Skacel says it was all down to Hearts fans providing him with super powers. The Czech midfielder hit arguably the best treble in SPL history on what may well be his farewell Tynecastle appearance for the Jambos. Three sublime strikes from outside the area provided the backdrop to this victory for Paulo Sergio’s side who were down to 10 men just 11 minutes into an enthralling encounter. Each of his three long-range goals was out of the top drawer and if this is to be Skacel’s final bow in a Hearts jersey then it will be long remembered by the 12,462 supporters at the match. Even Frank Sinatra would have struggled to conjure up such an amazing goodbye.